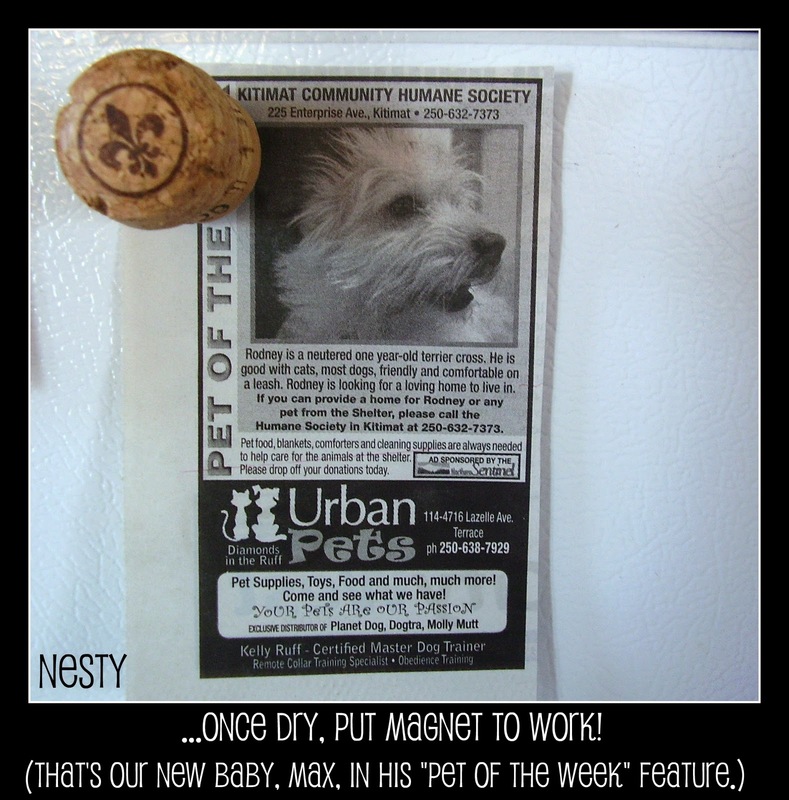 Nesty: Festive, Fast, & Functional Champagne Magnet! 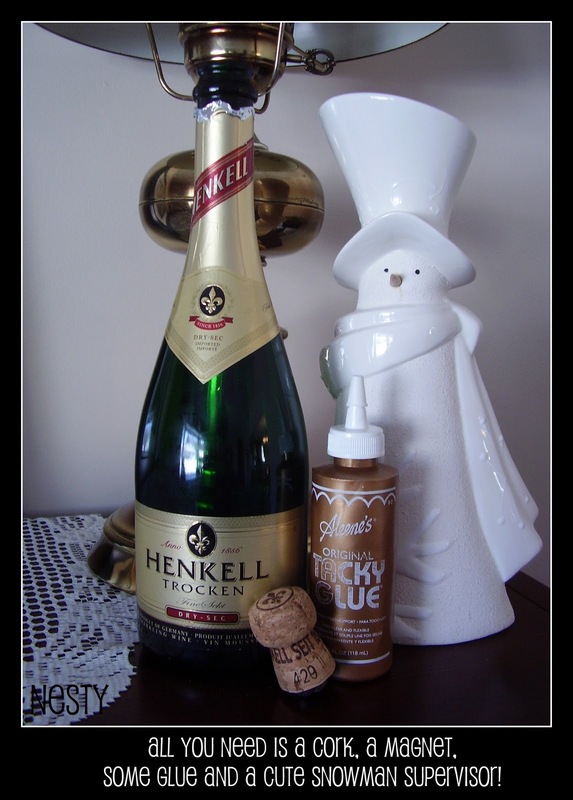 Festive, Fast, & Functional Champagne Magnet! Well, friends, we are well on our way to mid-January. This weekend I packed away Christmas, we ate the end of the baking, and tomorrow I am buying a healthy, clean eating grocery order. The "Christmas Hangover" is over and we are settling comfortably into the New Year. And I must say, it feels good. What's a "Christmas Hangover?" you ask? Not what you think it is...but more on that in a future post. After a much needed break, I am starting to feel creative again. The hand knit gifts (which you will see in the not too distant future) were much loved and appreciated, but yowzers my hands were sore by Christmas Eve! But now, now I feel like making stuff! The first urge came on New Year's Day. 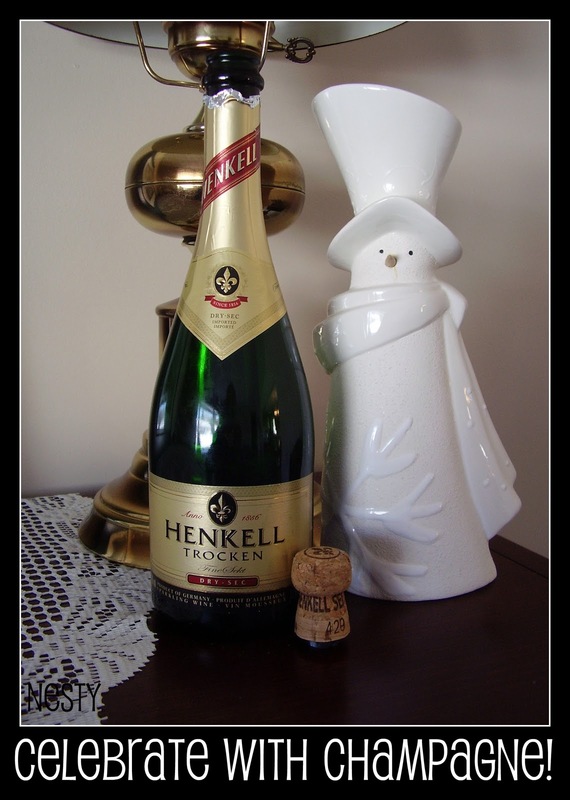 I was tidying the kitchen and I found the cork from our NYE champagne hanging out on the counter where it had been left the night before. 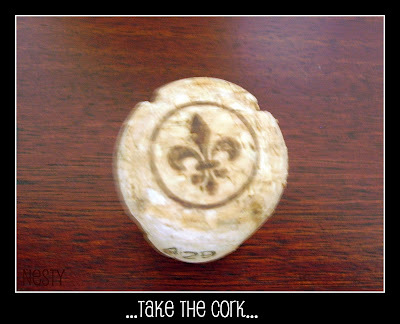 As I was heading for the garbage I took a look at the cork and paused. 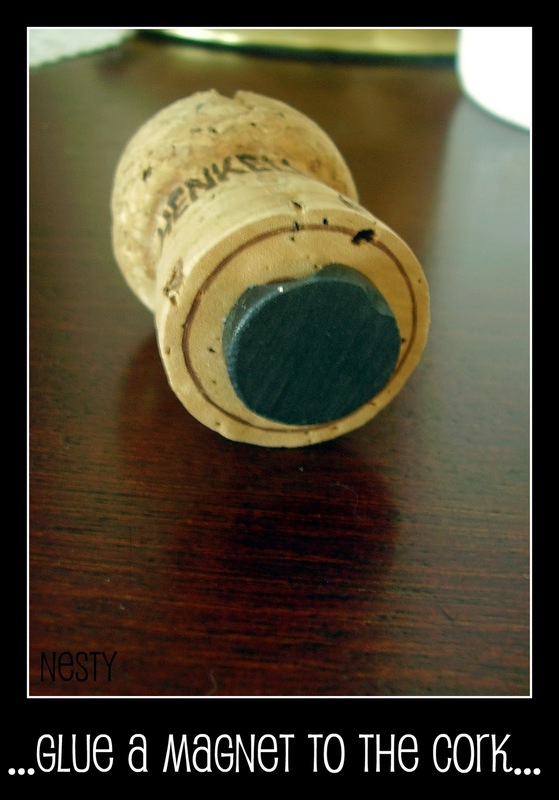 I've always loved champagne corks; I find them rather fascinating. There's the excitement that comes with removing it, of course, champagne is a celebratory drink and it's always fun to stand around and watch someone work that cork out. So much the better if it overflows, or if you have to duck to avoid a flying cork. In the calmer light of day, the cork itself is a little marvel of science, design, and ingenuity. How do they get it in there? And then it came to me...it would make a really funky fridge magnet! Turning to the fridge, I found what I was looking for; a plain circle magnet that had fallen off the back of another magnet a few weeks earlier. 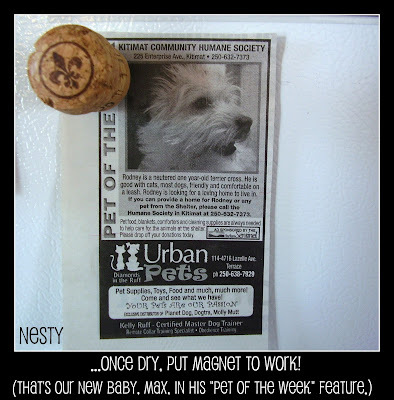 I'm not one to toss something functional just because it doesn't look pretty anymore, and so my plain 'ol magnet was earning his keep on the fridge, holding stuff up. Today, however, luck was smiling on my old, chipped magnet 'cause...it was makeover time! Next, get the cork. Isn't it pretty? Depending on the level of frivolity at your celebration, you may have to go looking for the cork. May I suggest under the sofa? Oh, and also depending on the level of frivolity at your celebration you may be about to have a whole collection of champagne magnets. Good for you! Cheaper by the case anyway!!! Magnets don't stick to cork all on their own, so go get the glue. 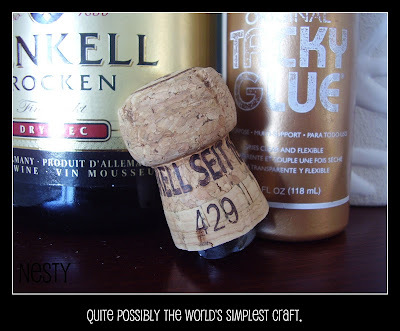 I used Aleene's Tacky Glue; I find it's good for adhering different kinds of surfaces to each other (like cork and magnet). A little tip; apply glue to both surfaces and let it sit for a minute before attaching them. This will make the glue tacky and will aid in adhering the surfaces. Now, let the glue dry. I didn't take a picture of this because I mean, come on. A picture of glue drying? Really? Be patient and let it dry well. Leave it alone for a few hours. This is the hardest part of the craft!!! We are all adults. Leave. It. Alone. There is a resemblance, no? Five pounds of love there, folks. Anyhoodle, the neighbors think we're wacky enough; yelling "Rod Stewart!" out the back door wasn't going to help our image so he became Max. I loves him! Good luck with your magnets! 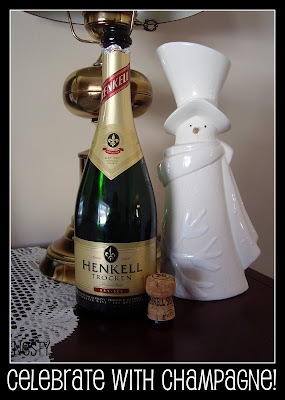 If you don't have your NYE cork anymore, what luck! Valentine's Day is right around the corner! 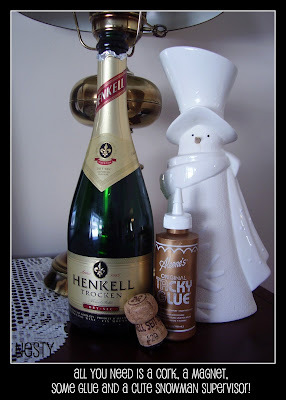 Friday is a Retro Recipe...and it's a goodie!!! See you then! Ha What a cute idea! Saw you on Paisley's Passions.